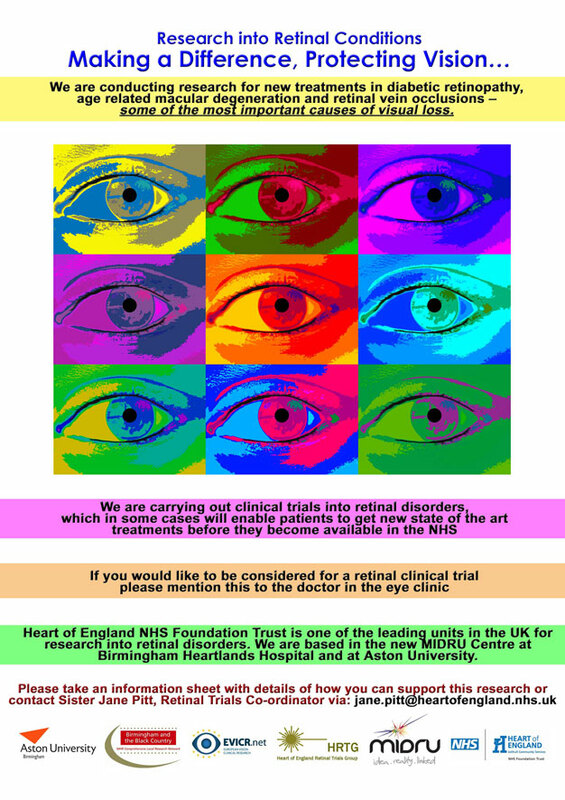 The Birmingham, Solihull and Black Country Screening Programme is part of The Heart of England Retinal Trials Group (HRTG). HRTG was set up in 2012 to create a strong research partnership in order to take part in commercial and non-commercial trials involving the retina. HRTG has access to state of the art equipment and experienced, accredited technicians located at the Retinal Screening Centre and MIDRU at Birmingham Heartlands Hospital and at Aston University. Completed Ranibizumab Treatment of Diabetic Macular Oedema (DMO) with Bimonthly Monitoring after Initial Treatment. Multicentre UK. Ongoing but not recruiting Study to Observe the Effectiveness and Safety of Ranibizumab Through Individualized Patient Treatment and Associated Outcomes. Global data collection study in age-related macular degeneration. Completed Study to Assess the Effectiveness of Existing Anti vascUlar Endothelial Growth Factor (Anti VEGF) in Patients With Wet Age-related Macular Degeneration (wAMD). Data collection. Ongoing but not recruiting Trial to Assess the Efficacy of Neuroprotective Drugs Administered Topically to Prevent or Arrest Diabetic Retinopathy. Multicentre Europe. Completed Ranibizumab Intravitreal Injections in Patients With Visual Impairment Due to Macular Edema Secondary to Central and Branch Retinal Vein Occlusion. Multicentre Global. Completed Data collection in diabetes. Ongoing but not recruiting A Multicentre Phase II Randomised Controlled Single-Masked Clinical trial to test the clinical efficacy of light-masks at preventing dark adaptation in the treatment of early diabetic macular oedema. Multicentre UK. Ongoing but not recruiting A Long-Term Safety Study of OZURDEX in Clinical Practice. (Patients with macular oedema following central retinal vein occlusion (CRVO) or branch retinal vein occlusion (BRVO) or patients with non-infectious posterior segment uveitis in real-world clinical practice). Multicentre Europe. Recruiting A randomised controlled trial of continuous positive airway pressure (CPAP) in patients with impaired vision due to diabetic retinopathy and concurrent Obstructive Sleep Apnoea (OSA). Multicentre UK. The Birmingham & Black Country Screening Programme has been involved in a multi-centred study which aims to improve the specificity of the current referral criteria for macular oedema. Seven different NHS trusts from across the UK have been involved including NHS Grampian, Heart of England NHS Trust, NHS Tayside, NHS Lothian, Royal Liverpool & Broadgreen University Hospitals Trust, NHS Fiffe and Oxford Radcliffe Hospitals NHS Trust with the University of Aberdeen leading the study. The purpose of the study is to determine the best method for detecting sight-threatening macular oedema using photographic surrogate markers for people with diabetes in the context of national screening programmes. Patients were recruited over a 3 year period up until the end of April 2011. 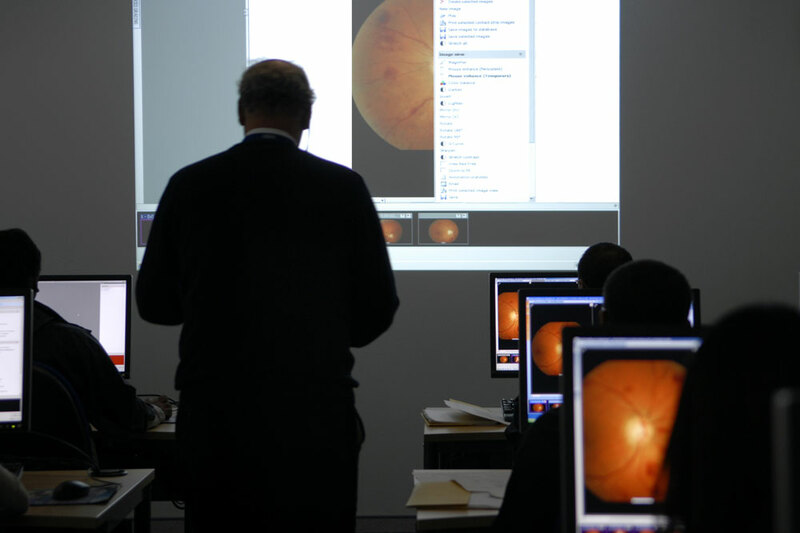 Over 3500 patients with photographic surrogate markers of macular oedema (exudates within two disc diameters, haemorrhages or microaneurysms within one disc diameter) have been recruited from the seven study centres. 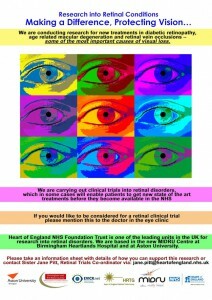 Each patient that met the inclusion criteria had retinal photography and OCT on both eyes where possible. All images were sent to Aberdeen University where they were analysed. The photographs were assessed by a reference grader for the presence of photographic surrogate markers and then annotated using computer assisted software to enable pattern analysis and lesion distributions. The OCT images were graded quantitatively and qualitatively for area, amount and site of retinal thickening which will assess the sensitivity and specificity of the surrogate markers. Software has been developed to analyse the distribution of retinal lesions in order to find the significance of photographic marker patterns on the likelihood of CSMO. The results have now been published. Prescott, G., Sharp, P., Goatman, K., Scotland, G., Fleming, A., Philip, S., Staff, R., Santiago, C., Borooah, S., Broadbent, D., Chong, V., Dodson, P., Harding, S., Leese, G., Megaw, R., Styles, C., Swa, K., Wharton, H. and Olson, J. (2014) ‘Improving the cost-effectiveness of photographic screening for diabetic macular oedema: a prospective, multi-centre, UK study’, British Journal of Ophthalmology, 98(8), 1042-1049.